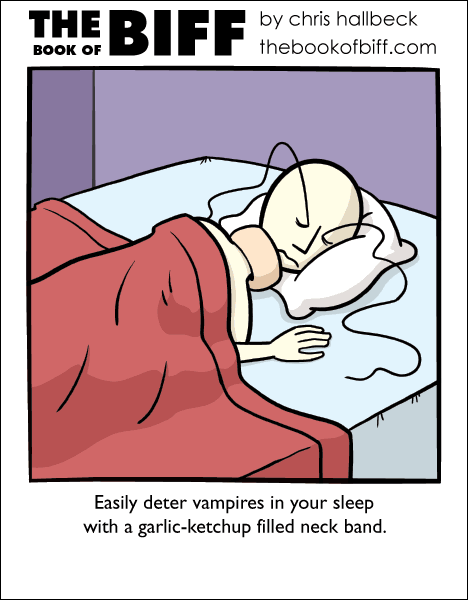 People assume it’s the garlic that repels the vampires. In truth though it’s artificial garlic flavoring. No effect. What actually bothers them is the high fructose corn syrup in the ketchup. A man with wings crashes through the roof of a house, and the man and woman who live there wonder what to do. Unless the Vampire is smart enough to send in a Grilled Hamburger Zombie to feast on the ketchup first….